Most of you have probably heard of cave tubing, which is extremely popular in Belize, mostly for cruise ship passengers because it is a unique short tour, and close to Belize City. But if you want the real deal, you will want to go cave kayaking instead. 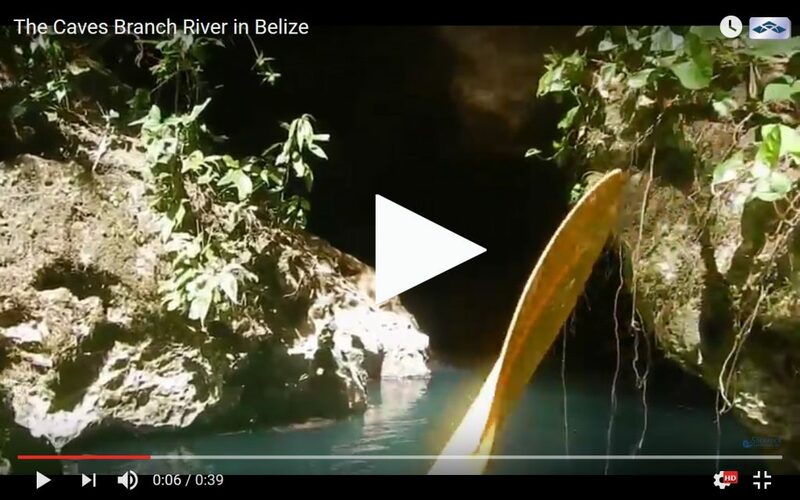 On our Belize Adventure Week 8 night package we run the Caves Branch River from top to bottom in hard shell sit-on-top kayaks. 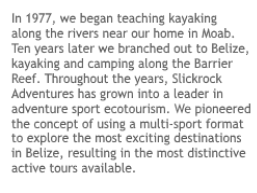 We have been running this river for about 30 years now, and were the first outfitter in Belize to explore the Caves Branch by kayak. We used to run it in rafts and inflatable kayaks but switched over to hardshell kayaks only about 8 years ago, mostly because of the mandatory portage where you have to deflate any inflatable boats and lug everything 1/4 mile through the jungle. The hard shell kayaks are much easier to simply drag that distance. Our recent guest Rick Pratt sent me a bunch of his video clips after his trip and I just love this one. It is of entering the cave at the beginning of the adventure. What an amazing feeling, to kayak right into the darkness! He really caught the feel of it in this video, and I wanted to share it with you. This one day adventure takes the whole day. You kayak in and out of four caves. There are also several windows that look out into the daytime sky with jungle flora spilling into the window. But mostly you are running this river in the complete darkness, with only your headlamp and the lights of others with you lighting the way. In the final cave you run into the cruise ship groups, but usually not too many as we run it on a day that there are less (or no) other tours. We have lunch along the way in one of the open areas, right before the portage. 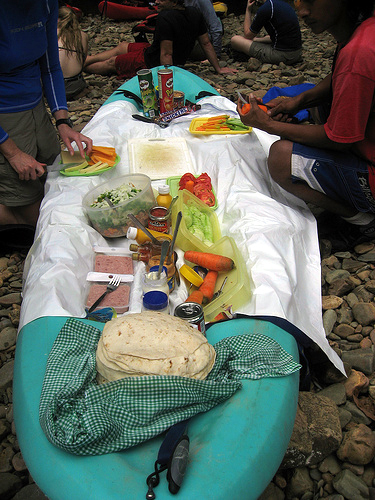 Lunch is served on the bottom of a kayak. What a fun day. At the end of the run our driver Jose has driven all the way around to pick us up. It’s surprising how far you have traveled, cutting off a huge section of road by paddling right through a mountain. We put-in at a spot on the Hummingbird Highway about 2 hours from Belize City. We take off on the Western Highway only 30 minutes from the city. Join us this winter for this one-of-a-kind adventure, along with the rest of the Belize Adventure Week itinerary: waterfall rappelling, ziplining, hiking, whitewater kayaking, sea kayaking, snorkeling, scuba diving, kitesurfing, windsurfing, kayak surfing, sport fishing, kayak fishing, paddleboarding, and board surfing (not to mention hammock surfing!) All these sports, in one action-packed 8 day trip.